A few weeks ago I wrote a post for my birthday, I am 25 and have no idea what I am doing. Something that I don't think I covered very well was that even though I am not where I thought I'd be I am proud of what I have done. It's okay to be proud of yourself. We often get lost in all of the things we should be doing or all of the things we thought we would do but haven't. I think its important to realize that you are not where you were a year ago, three years ago, five years ago. When we don't get instant results we loose our momentum. If you keep working hard you will reach your goal. Think of all of your accomplishments, including the small ones. 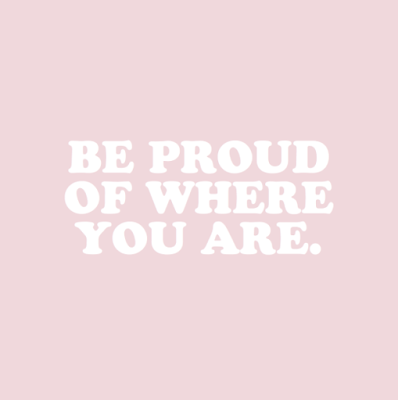 Be proud of all you have done, focus on what else you want to work towards and keep going! What are some big and little goals you are currently working towards?